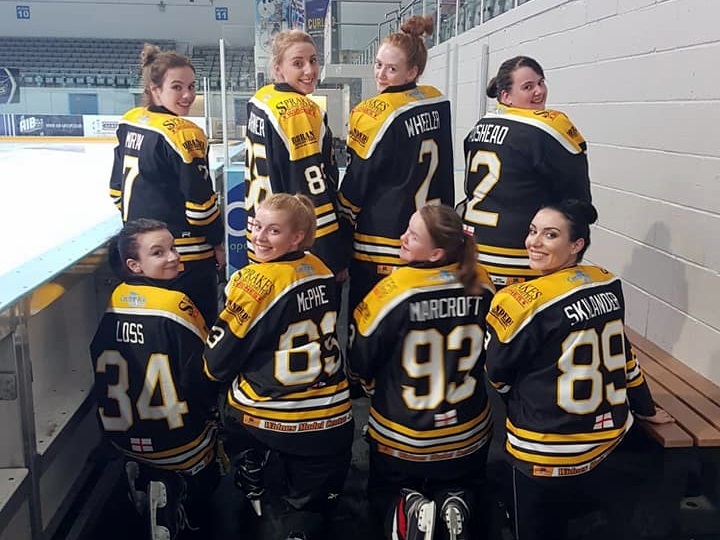 The Widnes Wild women’s team opened their 2018/19 EIHA Women’s Premier League campaign with a 10-3 defeat away to the Milton Keynes Falcons and, while a defeat is always disappointing, this match must be looked at in a wider context. The Wild team had 6 brand new players on their bench – 5 of whom had never played competitive hockey at this level before. They handed WPL debuts to Josie Moran, Katie Adshead, Kathryn Garner, Danielle Skilander and Laura Marcroft and back up netminder Philippa Wheeler also made her first appearance in Wild colours, having made the move from Nottingham Vipers. Despite the somewhat one-sided final scoreline, the new look Wild women gave a very good account of themselves and the first period was very closely matched with lots of chances for both sides. The home team took the lead after 5 minutes and went two up after 9 but then the Wild’s Belgian international player Leen de Decker fired in a powerplay goal (assist Sumner & Pearson) to halve the deficit. Two more goals followed for the Falcons and the 4-1 scoreline at the end of the first period probably flattered them somewhat. The second period, however, was nearly all Falcons and they out-shot the Wild women by 24 to 8. Two home goals during the period effectively finished the game off as a contest and they had added three more by the time de Decker scored the Wild’s second goal of the game at 51.28. Sav Sumner added a third for Widnes with 2 and half minutes left on the clock and Milton Keynes rounded off the scoring with their 10th goal of the game at 58.47. The Wild women have three more away games before their first home game of the new season. They travel to Sheffield on 13th October, Nottingham on 28th October and Kingston (Hull) on 11th November before playing at home to the Whitley Squaws on Sunday 9th December at Planet Ice Widnes.